Moorings up to 6 mt. Moorings up to 8 mt. Moorings up to 12 mt. Moorings up to 18 mt. Moorings up to 25 mt. Stalls on the ground for small vessels and/or cars. The transit pier can host up to 35 watercrafts, with 12 equipped moorings. 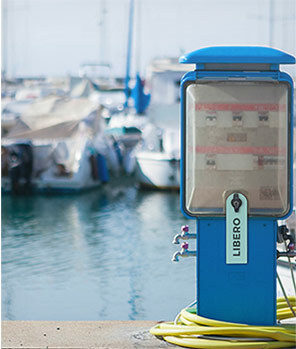 Marina Chiavari is the only harbour in the Tigullio area that has this innovative service available, dedicated to smaller vessels, not only for clients, but also for external clientele that are interested in using the slipway to launch their boat. To arrange this service, contact the marina staff, available 24/7 at +39 3392291037. Parking spaces available inside the port area , with entry through a controlled access system. Businesses including restaurants, pizzerias, lounges, pubs, fashion boutiques, hair salons, jewelry stores, brokerage firms, naval artisans and nautical professionals.